High Profile Archives | Stratos Jet Charters, Inc.
We are strong believers in transparency. When you are looking for a reputable business jet charter broker, we encourage you to ask important questions. At Stratos Jet Charters, we want our clients to feel they have the right information to make informed travel choices. So here are our Questions to Ask Your Jet Charter Broker, and our answers to those questions. Stratos has been serving the jet charter industry since 2007. Founder Joel Thomas built Stratos Jet Charters with the belief that success is the result of a continual pursuit towards excellence. Our business success is not a static achievement, but a sustained, ongoing effort to improve air travel for our business jet charter clients. 2. Can I read reviews? 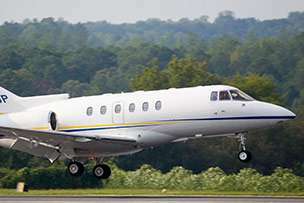 Our Stratos Jet Charter reviews can be found on this Stratos Reviews Page. And we hope that after you have traveled with us and experienced our jet charter travel professionalism, you will continue the dialog by adding a review of your own. 3. What is your industry accreditation? Our business jet charter clients know that Stratos maintains some of the most stringent accreditation in the air charter industry. These accreditations fall into two important categories: company practices and airline safety. As industry leaders, Stratos voluntarily opens its books to both ARGUS and Wyvern, which audit the charter airline industry, to ensure fair pricing practices. We also subscribe to the highest safety standards of the Air Charter Safety Association. Stratos belongs to seven corporate and safety organizations; you can find them on our Stratos Accreditations webpage. 4. 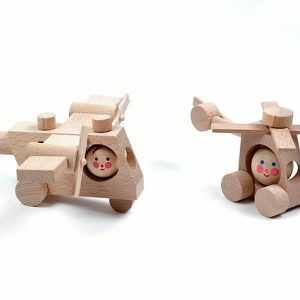 Is my aircraft safe? We strive to make every business jet charter experience as safe as possible. Even in a highly competitive industry, we will never sacrifice safety to provide lower prices. Our approach is pro-active. We pre-screen our aircraft operator partners to ensure they are in compliance with Part 135 of the Federal Aviation Regulations. We review their training and maintenance standards and ensure they measure up to third-party safety audits. Our customers deserve nothing less. 5. 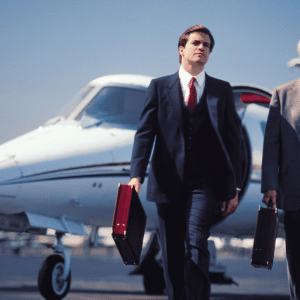 What does a business jet charter flight cost? At Stratos Jet Charters, we have two pricing models, depending on your preference. The most common is On-Demand Pricing, which is based on three variables: the type of aircraft being chartered, the availability of this aircraft, and the aircraft’s location relative to your departure location. To help you estimate the costs, we recommend our using our Instant Quote Calculator, or you can also look at our commonly-flown routes on our Pricing Page. The second pricing model is Fixed Rate Pricing, available with our Stratos Jet Card Membership. You can lock in hourly rates for an aircraft and only pay for the time you need, without worrying about repositioning fees or rising fuel costs. Many of our corporate clients love the convenience and easy accounting that comes with Fixed Rate Pricing. We hope these questions and our answers have given you an insight into our culture of safety and our desire to provide superior customer service at Stratos Jet Charters. When you are ready to arrange your next luxury charter flight anywhere in the world, call Stratos Jets—888-593-9066. For reasons relating as much to their profits as the planet, America’s major airlines are reconsidering how much fuel they burn on each flight. As jet fuel prices rise more rapidly than demand for seats, carriers have been forced to hike rates and restrict their flight schedules. 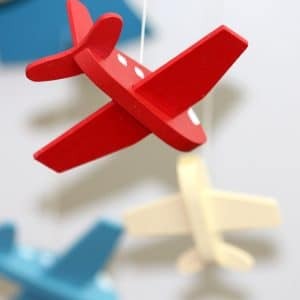 Additionally, new international agreements are poised to come into effect in the coming years, forcing airlines to explore sustainable alternatives to their current fossil fuel consumption. In fiscal and regulatory terms, improved efficiency is imperative for the industry. But there may be another reason for airlines to adopt environmentally conscious practices: public opinion. Recent years have seen a surge in consumer support for fuel-efficient automobiles, but does the public have equivalent expectations for air travel? We set out to find the answer. In this project, we gathered government data related to fuel efficiency and passenger volume for America’s 10 largest airlines, studying the efficiency records of the biggest names in air travel. We then surveyed 1,000 individuals about their environmental attitudes regarding air travel and whether they’d be willing to pay for more sustainable flights. Our findings present demographic differences in concerns about airlines’ carbon footprints, as well as ideological contrasts across the political spectrum. To learn how environmental concerns stack up against travelers’ other priorities, keep reading. 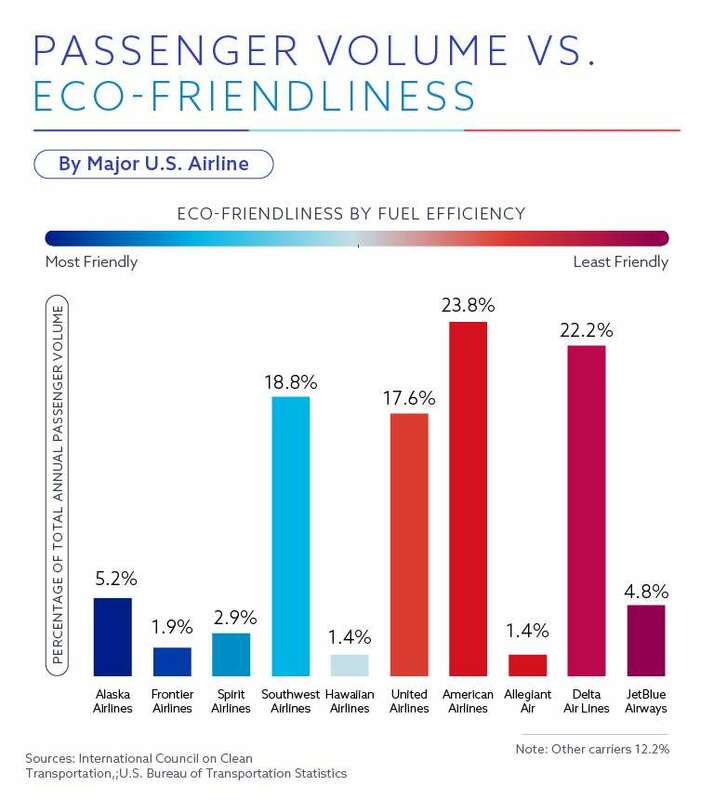 Our findings suggest that market share and fuel efficiency rarely coincide: Many of the airlines Americans fly most frequently are among the least environmentally friendly. American Airlines (the country’s most popular carrier) and Delta are emblematic of this trend, although these companies have invested in newer, more efficient aircraft in recent years. Southwest Airlines provides an interesting counterexample, however, serving nearly 19 percent of all passengers while maintaining a relatively strong efficiency record. The company aims to continue this balancing act by adding more fuel-efficient Boeing 737 Max aircraft to its fleet in the years to come. Smaller airlines have a mixed record on efficiency. Alaska Airlines and JetBlue serve a similar proportion of flyers each year, yet they could hardly be more different in terms of environmental impact. In fact, Alaska Airlines has been hailed as a model for sustainability in the industry: The carrier is consistently profitable, proving that paying attention to emissions can be good business. Conversely, JetBlue ranked dead last among the carriers studied. Interestingly, the company’s founder has recently formed another airline startup, and his business plan hinges on operating more fuel-efficient jets. Will sustainability ever become an essential concern for airline travelers? In some respects, our respondents seemed to possess the attitudes necessary to spur such a change: Three-quarters said they agreed with the statement “I am concerned about climate change.” Because air travel accounts for a significant and growing percentage of global carbon emissions, these feelings would certainly seem relevant to the industry’s future. 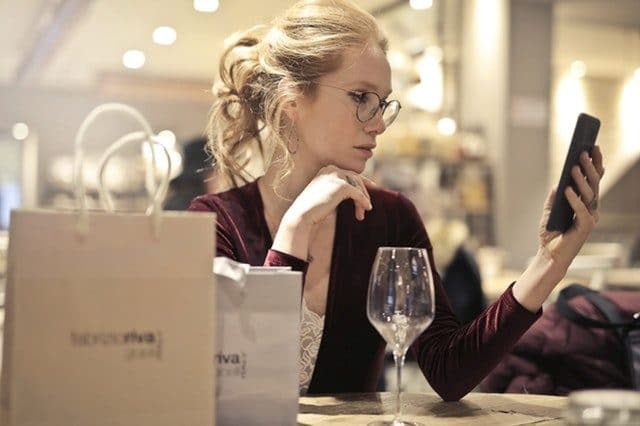 Additionally, 72 percent of respondents agreed with the sentiment that individual consumer choices can make a difference in environmental matters. Yet these sentiments stood in stark contrast to another finding: Most consumers aren’t willing to pay significantly more for environmentally friendly flying. 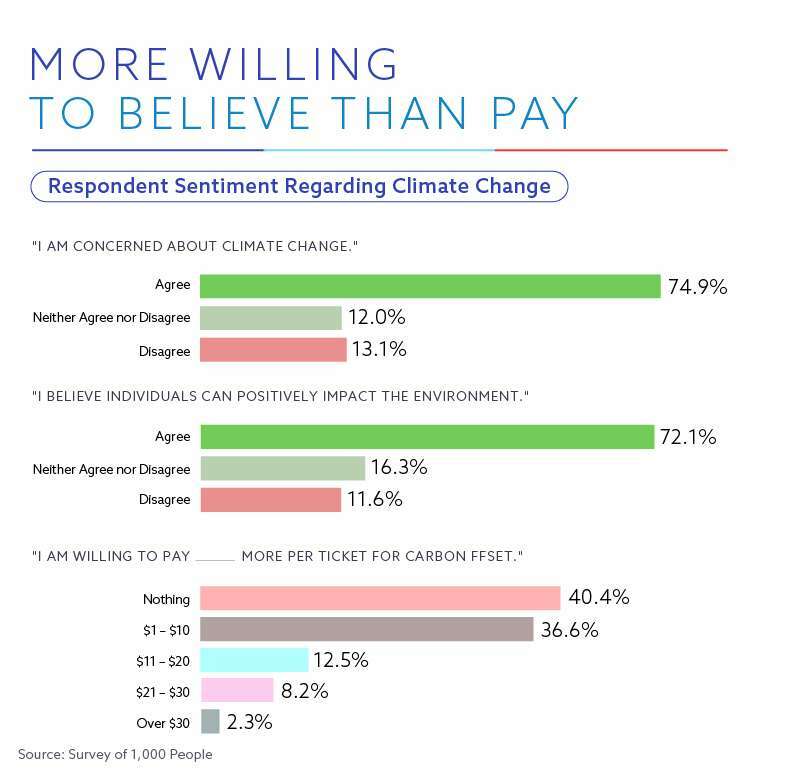 In fact, 40 percent said they wouldn’t be willing to pay anything extra for a ticket that incorporated some kind of carbon offset program. Of those who would pay something, large contributions were rare: Merely 10 percent would add $21 or more to their ticket price. These findings contradict broader patterns in conscientious spending: Globally, 66 percent of consumers are willing to pay more for sustainable goods. But when we studied our respondents’ motives more closely, an emphasis on thrifty flying became clear. 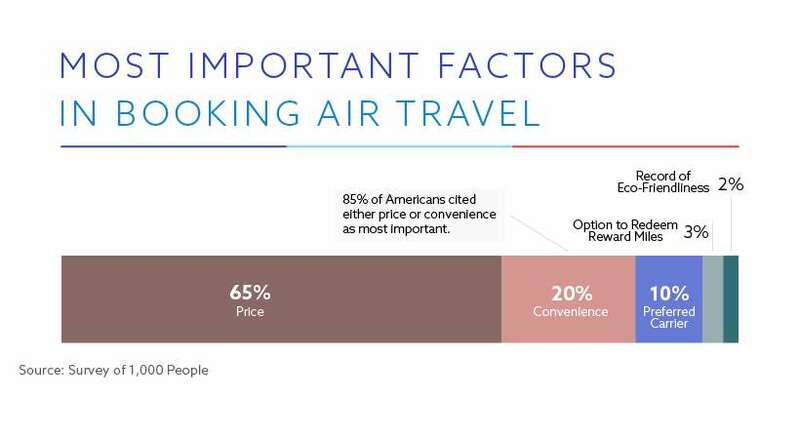 Price and convenience far surpassed other factors in informing our respondents’ airlines selection: 85 percent of respondents picked one of these two as their top priority. These findings speak to the effects of competition in the air travel industry: As more airlines fight for consumer dollars on price-comparison platforms, flyers can get picky with regard to price and flight timing. Comparatively speaking, environmental questions were just a remote concern: Two percent of respondents rated an eco-friendly track record the least important factor in choosing which airline to fly. Because climate change continues to sow division on Capitol Hill, it’s reasonable to expect concerns about the environmental impact of air travel to differ by political affiliation. 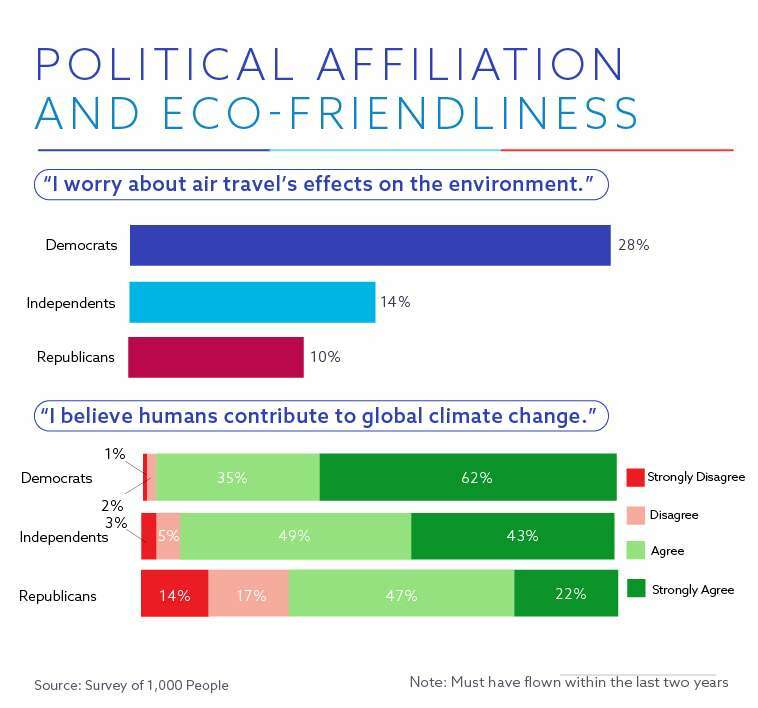 Still, the disparity between Democrats and Republicans is quite striking: Whereas over a quarter of Democrats said they worried about the effects of air travel on the environment, just 1 in 10 Republicans said the same. Independents aligned more closely with Republicans on this issue; just 14 percent said they worried about the subject. Among Democrats, Independents, and Republicans, the majority agreed or strongly agreed that human actions contribute to climate change. This finding presents yet another seeming contradiction: Although people across the political spectrum acknowledge the impact of human activity on the planet, most don’t worry much about emissions from air travel specifically. Perhaps those who care deeply about environmental issues are simply making changes in other aspects of their lives, reluctant to relinquish the travel that planes make possible. Indeed, some critics have even identified air travel hypocrisy among climate change scientists, noting that many jet around the world to conduct research and attend conferences. Perhaps it’s unfair to expect some consumers to pay more for sustainable flying – many Americans find the price of travel uncomfortably high already. 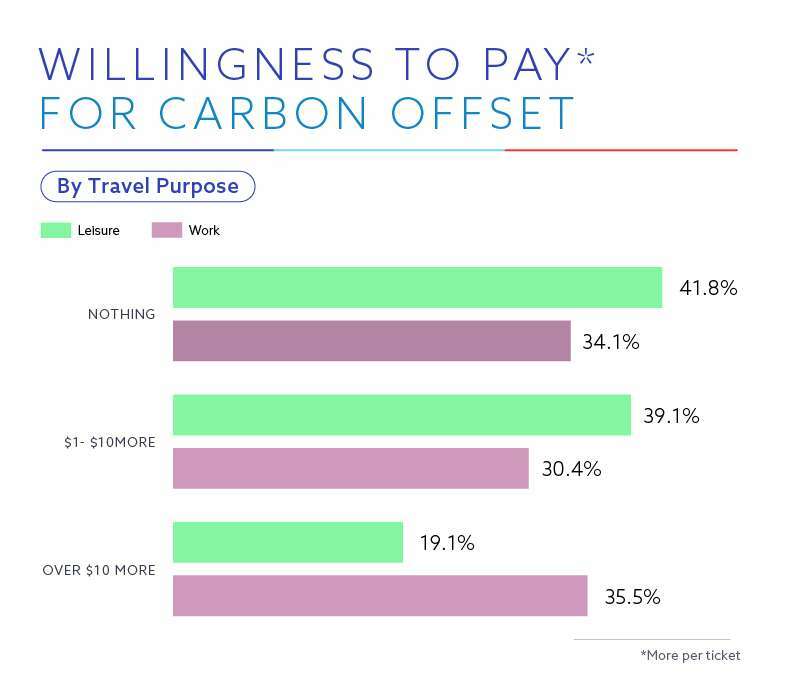 But our findings suggest wealthy travelers are actually least likely to pay for a carbon offset. Of those who earned $100,000 or more each year, 47 percent said they’d be unwilling to pay anything above current prices. Comparatively, 36 percent of those who made less than $50,000 would be unwilling to pay anything to curb the carbon footprint of their flight. One possible explanation for this counterintuitive trend may be the frequency with which each income group travels. It’s reasonable to assume that those with significant means fly more frequently, so the additional cost per ticket could add up over dozens of flights. Conversely, those who earn less may only travel occasionally – if at all. One recent study found about 1 in 10 Americans never leave their home state. Of course, you may not mind an additional carbon offset fee if your job pays for your ticket. That attitude may explain why business travelers were less likely to say they’d pay nothing than those who typically fly for leisure. Likewise, business flyers were much more likely to approve of an added sustainability cost above $10. With Americans taking approximately 460 million business trips each year, those added fees could make a significant difference. We also saw a difference between generations. 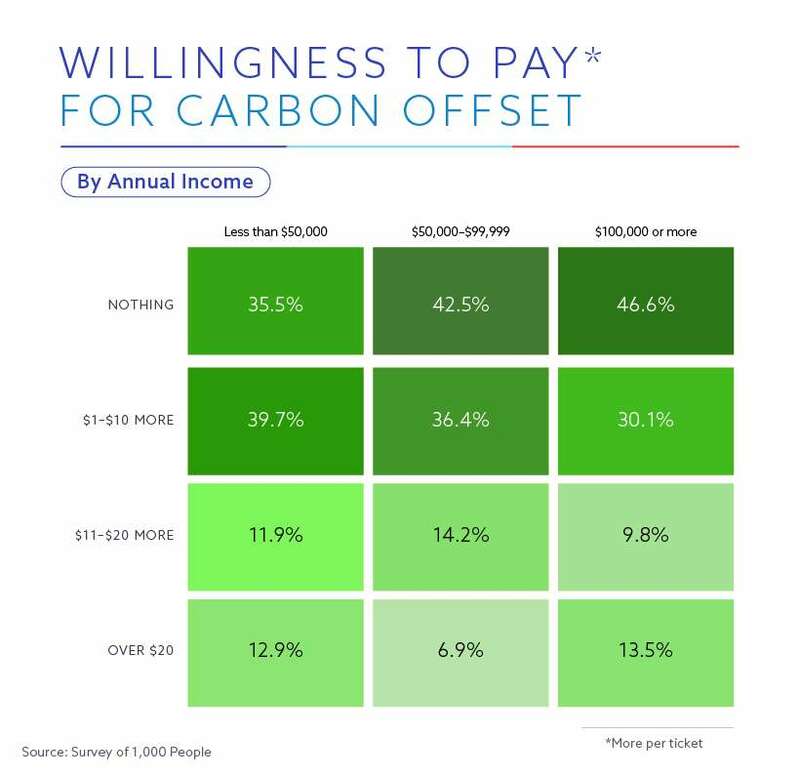 Over 60 percent of millennials were willing to pay more per ticket to offset their carbon footprint, and a quarter reported being willing to pay over $10 per ticket. 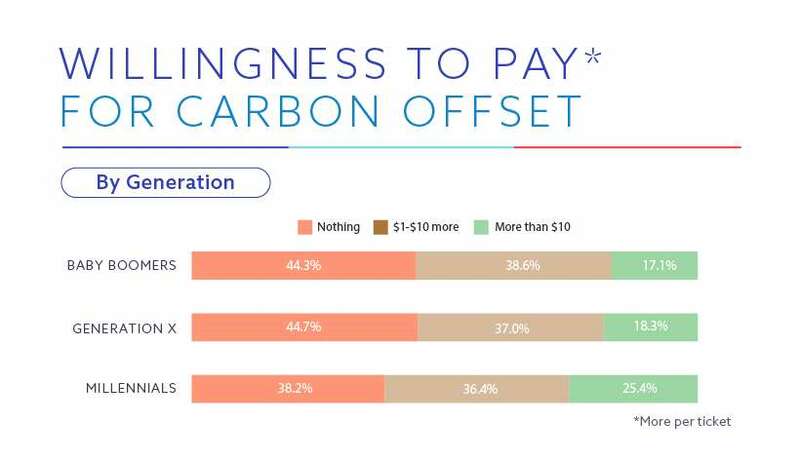 On the opposite end, 44 percent of baby boomers said they wouldn’t pay a dime more to offset the carbon footprint of their tickets. Our results suggest a gulf between abstract concerns and concrete action: Although most respondents expressed worries about global warming, few passengers were willing to pay substantially more for environmentally friendly flights. 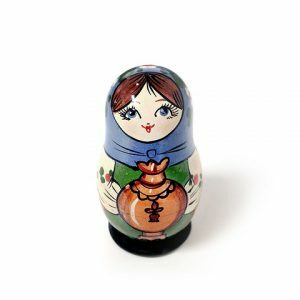 In the long run, however, consumer savings and sustainability may prove compatible. As fuel prices climb, carriers are looking to fuel efficiency to lower costs, and consumers could eventually benefit from these savings. And while short-term investment in newer technologies may raise ticket prices temporarily, that investment could help keep flight prices reasonable in the years to come. Whether you’re looking for low costs or luxury, great flying experiences depend on responsive service. If the team behind your flight drops the ball, even a great deal can prove disappointing. Stratos Jets offers an unparalleled degree of personalization to ensure your private jet experience delivers the luxury you deserve. To see how much better flying private can be, check out feedback from real customers. We surveyed 1,000 people on recent air travel and their beliefs about climate change through Amazon’s Mechanical Turk, with a survey built on SurveyMonkey. Our respondents included 498 men, 500 women, and two respondents who specified a different gender. To qualify, respondents had to have taken at least one commercial airline flight in the past two years. To determine environmental friendliness rankings, we used the 2015-16 ICCT Fuel Efficiency Rankings (released 2017), and passenger volume was taken from the U.S. Bureau of Transportation Statistics. We did not include an attention-check question in this survey, so it is possible that our results are skewed by respondents who did not take the survey seriously. The data we are presenting rely on self-reporting. There are many issues with self-reported data. These issues include but are not limited to: selective memory, telescoping, attribution, and exaggeration. Fair Use Statement If you’d like to help us spread the word regarding airline fuel efficiency, you’re welcome to share our project for noncommercial purposes. If you do, please include a link back to this page to attribute our team appropriately. Creating comfortable, beautiful and functional aircraft terminals was the biggest aspiration of airport designers over the last 75 years. But unlike other structures, airports are constantly evolving. Changes in aircraft, runways, security needs and passenger demand will impact an airport’s functionality. 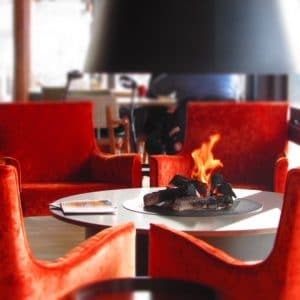 The good news for Private Jet Charter Travelers is that many private jet airports are looking to luxury hotels for inspiration. Here are some ways private jet charter airports are working to make your travels more comfortable. 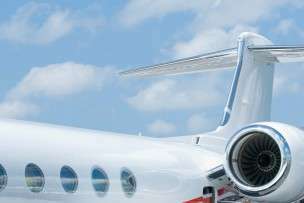 The airline industry refers to Private Jet Terminals as FBO’s (Fixed-Base Operators). Essentially, FBOs provide aircraft maintenance, fuel service, catering, ground transportation and hangar services. Until recently, the aircraft would get lots of pampering, but the passengers had to make do with whatever facilities were available. However, times have changed, and terminals must compete with service in addition to price. This is the biggest change in recent years. The Private Jet Charter Traveler expects a certain level of style and comfort. FBO lounges are being re-designed with stylish, ultra-comfortable chairs, functional work-spaces, a bar and perhaps a spa area. Some even border on whimsical, with hammocks and foosball tables – just in case you miss summer camp. This is obvious when catering to business travelers, but some FBOs lacked the bandwidth and security to meet the demand. Many have invested heavily in upgrades, to provide a seamless wireless experience for passengers. By catering to a more discriminating clientele, FBOs have attracted upscale business partners. For example, Harrods luxury department store opened FBOs at airports in Britain and intends to franchise out the brand. Hotel chains are also creating their own FBOs. Hilton recently opened a FBO/Hotel on St. Simons Island in Georgia, U.S.A. It is the height of convenience: passengers can literally walk off the aircraft and into the hotel. Long gone are the days of waiting in a shabby lounge while your private jet charter aircraft is being readied. Book a flight today, and discover the extraordinary comfort of the new FBOs! If you’re looking for a private jet rental company that can arrange luxury charter flights to anywhere in the world, call Stratos Jets—888-593-9066.